I have had the Urban Decay Wende's Contraband Palette since December when Sephora had it on sale for $22 ($34 originally). At that point I still only owned one Urban Decay palette and that was the Gwen Stefani collaboration, which really isn't like an OG UD palette at all, so I didn't know much of anything about UD eyeshadows. But when I saw this palette with its bright pop of teal and purple, plus the low price, I knew I had to have it. Since that time I have only worn it twice but this week I took it out again and not only wore it, but took some photos and swatches to share with you. 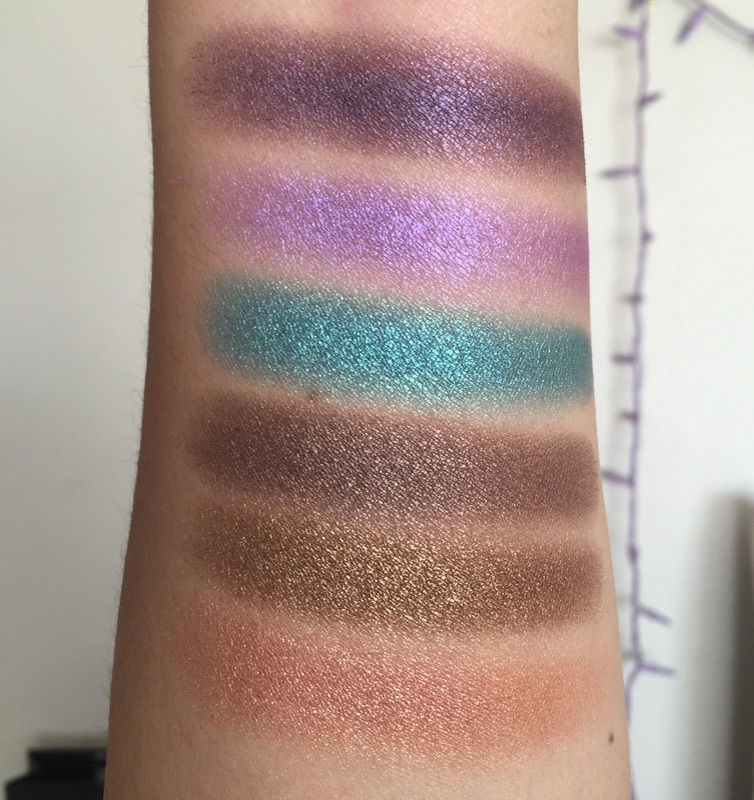 From what I have read, the six shades in this palette are either UD permanent or have already been released in other palettes, so if you are an avid Urban Decay collector then you probably already own all of these shades. I like that Wende's Contraband palette is small and that it has both a mirror and a liner, though these are NOT my favorite liners for the waterline at all. Still for the $22 that it cost me, I thought that it would be a nice way to dip my feet into the famous Urban Decay eyeshadows. 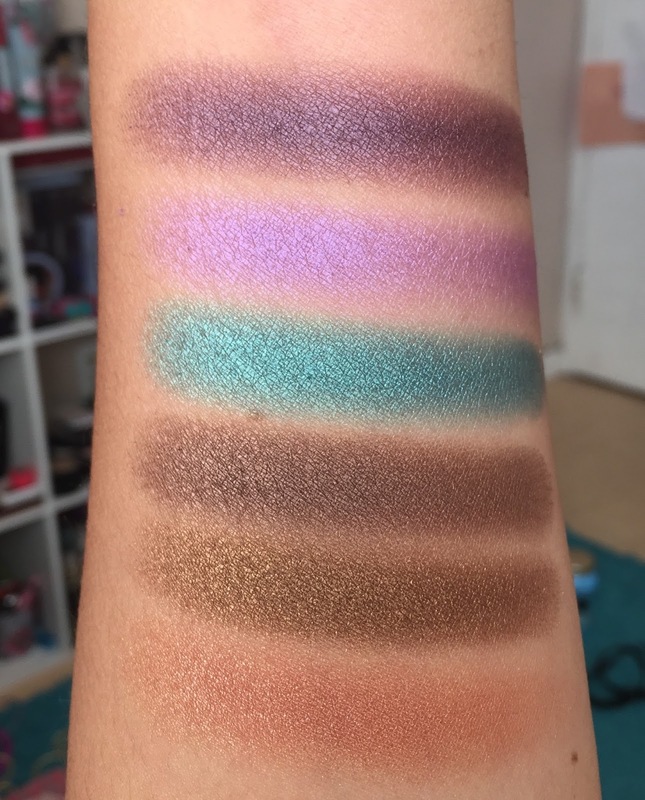 trick: I've seen swatches of this eyeshadow online that are beautiful, I don't know why mine is such a dud. I got hardpan on it almost immediately which made swatching very difficult, and on top of it I don't think the color is that great. smog: I know that most of you already own this shade and I guess it's been repeated to death so you guys are probably sick and tired of it. But since it's brand-new to me, I think it's off-the-wall amazing. From the moment I touched it to swatch it and seeing how pigmented, soft and shimmery the shade is, I totally fell in love. reign: I feel the same about reign as I do about smog, both of them have a beautiful shimmerry finish, they're both super soft, super creamy and they're just absolutely gorgeous colors. I can see using these two colors so much during the summer. deep-end: deep-end is a beautiful teal shade that has the same formula as smog and rain. 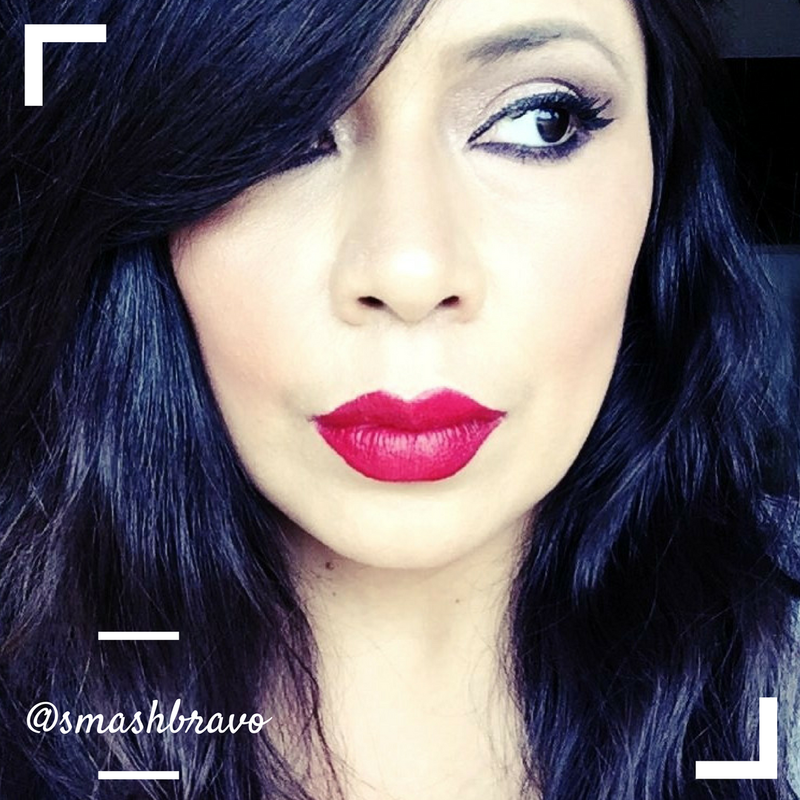 This shade thank goodness is as beautiful in the swatch, and on the eye as it is in the pan. Now this, is a bright pop of color that totally delivers. flash: flash is such a terrible dud and it's so disappointing because it's one of the main reasons that I purchased this palette. Not only did I get hardpan, but it's also so light with almost no pigment that I had to layer my swatch at least five times. This is definitely a poor excuse for a bright pop of color, because you're going to be missing both the brightness and the color. tornado: tornado is just kind of blah, it's not as bad as flash but it's nowhere near as nice as deep-end and reign. For me the three winners of this pallet and the ones that make it worthwhile purchasing are smog, deep-end and reign. These three shades are beautiful enough to carry off the fact that the three other shades are pretty bad. Here's an example of one of the looks that I created using smog, deep-end and reign. You can definitely create a very fun look with deep-end. It really is one of the most beautiful teal eyeshadows that I have ever seen. At the end of the day I only paid $22 for the Urban Decay Wende's Contraband Palette and I guess that is a fantastic value for three really good high-end eyeshadows. If you don't already own smog, deep-end and reign, then I would suggest you buy it, but only if you find it on sale. It's weird that I have such a mixed review about this pallet but I tell it like I see it, and unfortunately three of these shades are not winners in my book. But the three that are good, are amazing and I would DEF buy all three in full-size.